Lapis Lazuli is available through Home FurEver. She recently had her first birthday with us, and we’re hoping to find her a forever home soon. We found Lapis’ VERY pregnant mother in the street near our house just a couple of days before giving birth. Rebecca (the mother) had her puppies in our home. 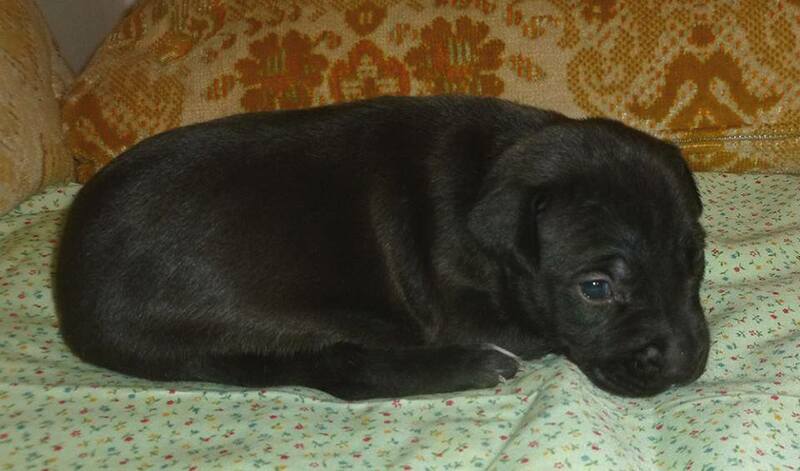 We named the puppies after Steven Universe characters, and we call the litter the Crystal Pups. Lapis has been with us since birth. 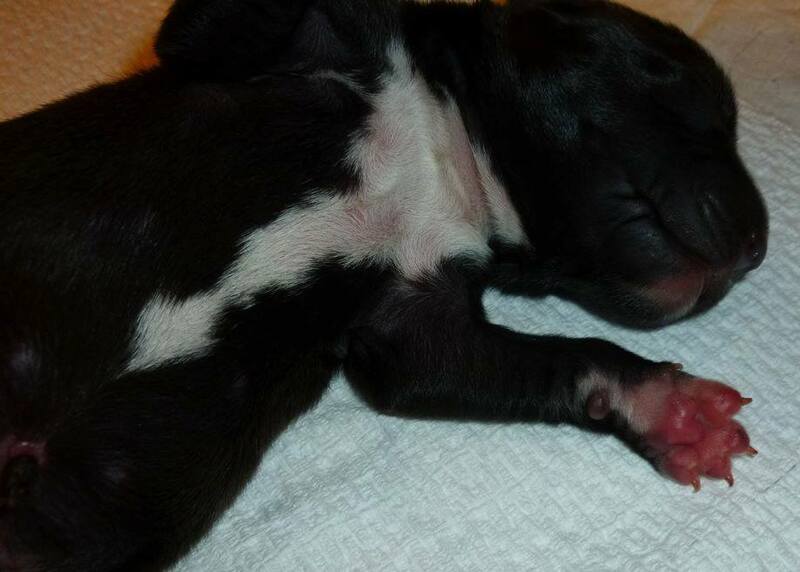 Lapis at two days old. 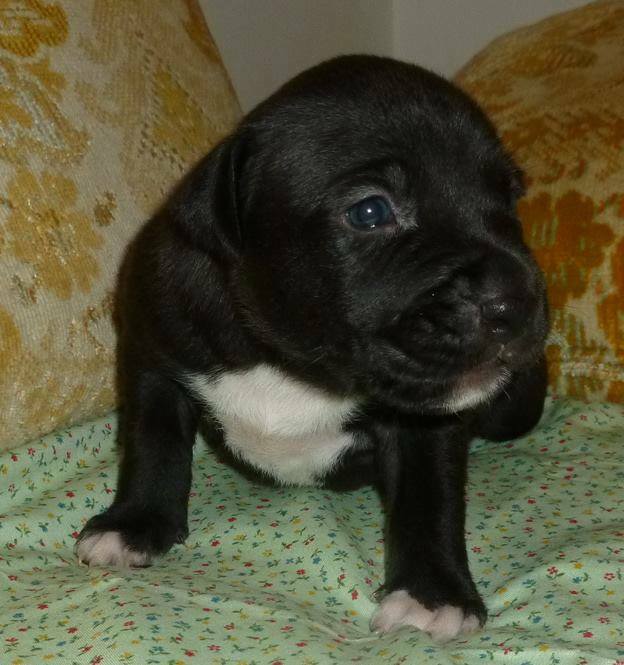 Lapis was the last puppy in her litter to be born. She started off the smallest (but not really a runt). When she was four weeks old, she had to spend a week in the hospital due to a minor intestinal issue. She came through with a clean bill of health, but the timing couldn’t have been worse. By the time they let us bring her home, her siblings had all been on solid food for several days. Lapis was on formula at the hospital, and when they’re that tiny even a few days of dietary changes makes a BIG difference. The other Crystal Pups had put on weight and grown quite a bit, but Lapis was almost the same size as when she’d left. She also smelled different, which is very confusing for small puppies, and she’d missed a crucial period of puppy socialization. Our poor little girl no longer fit in with her own family. when she finds something interesting. Lapis was desperate to rebuild the bond with her siblings, but she was much smaller, weaker, and less coordinated than they were. She also didn’t recognize any of their body language. She couldn’t understand when they didn’t want to play, and they couldn’t understand why she would never back off. The situation quickly degraded, to the point where all the puppies got frustrated and were constantly scrapping; one of her sisters – Amethyst – even attacked her, necessitating a (brief) return to the hospital. We had to make the hard decision to separate Lapis from the rest of the Crystal Pups for her own safety. I will never forget sitting up with her that first night. If dogs could cry, she would have been sobbing. She spent the whole night staring miserably into space, either shaking in fear or whimpering with loneliness whenever she heard the other puppies playing. She had never been interested in petting or cuddling before then, but that night she stayed on my lap and wailed inconsolably whenever I had to leave the room. A few days later, her cuts had healed and we were able to start bringing her back with her siblings. A couple of them had been adopted out by that point. Puppies love playing together, but any animal needs a break sometimes…with some of the Crystal Pups gone, the others were much calmer. They still didn’t like her, though; and Amethyst hated her. She hated Lapis, hated her, HATED HER. And Lapis had not only missed even more socialization time, but was so nervous around them now that she was even less able to pay attention to their body language. The few times they invited her to play, she thought they wanted to fight and responded by either running away or barking aggressively. It took several weeks for us to fully reintegrate her with the other puppies. In the meantime, we had to restrict her interactions with them: she got up to half an hour of supervised, structured play with them once or twice a day. The other puppies could play together for most of the day with only minor supervision, but 20 or 30 minutes was all they could tolerate when she was in the room. We also paired her with our very tolerant and loving older dog. He instantly wants to befriend almost every other dog he’s ever met and he’s very good at helping us work with the strays we’ve found over the years, no matter how traumatized they are. After just a few days he’d shown her how to politely initiate play and when to back off. It took a while for her to apply those lessons to dealing with her siblings, but we saw the improvement in her behavior and in how the other puppies reacted to her within a couple of weeks. At four months old, we only had a few of the Crystal Pups left and most of them got along just fine together. The only one who still couldn’t accept Lapis was Amethyst. We could not leave them alone for more than a few minutes without Amethyst snapping at Lapis, or Lapis getting upset that Amethyst wouldn’t play with her. 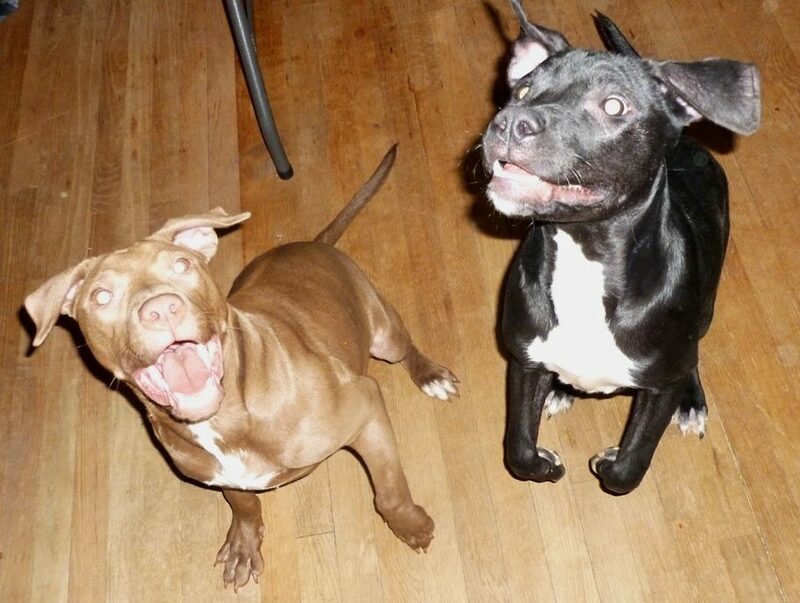 Both girls were very sweet, friendly puppies on their own; they just couldn’t get along. We have a large house, but most of it is in the middle of renovations and we just don’t have much space to give our own dogs their space and to separate individual cranky puppies. We decided to crate the puppies near one another and swap their blankets so they could get reacquainted with each other’s scents. One by one, the other puppies were adopted to loving forever homes. When they were a little over six months old, Lapis still hadn’t found her forever home…and neither had Amethyst. Amethyst (L) and Lapis (R), just derpin’ around. Happily, the sisters were finally, finally, enjoying each other. Over the next several weeks, they became best friends. They learned how to play together, and had such fun together that the pendulum began to swing the other way: they began to bond on another too much, and to ignore our attempts at training. To make sure they could be happy in their future families, we had to split them up for a while every day. While all of this was going on, we also took in another pregnant stray; this one was a partially feral shepherd mix that we’d been trying to trap for months. The new mama dog gave birth to nine healthy puppies (the Shadow Pups) and BOOM: just like that, we were managing fifteen dogs. It didn’t matter that nine of them spent their first few weeks sleeping and eating; one feral dog can be harder to wrangle as five well-behaved ones, and a feral mama dog takes ten dogs’ worth of care. We got to the end of those first difficult weeks with little incident. This was mostly because Amethyst and Lapis were such good friends, but it also helped that Shadow Mommo quickly recognized the value of a warm home and steady food. During this time, a lot of our energy went to the Shadow Pups: there were vaccines to schedule, adoption applications to review, and acclimation exercises to get through with Shadow Mama. We did our best to keep up with Lapis’ and Amethyst’s training, but we just couldn’t give them as much time with us as they’d had before. They were a little jealous, but it would have been much worse if they didn’t have each other. Amethyst was soon adopted, leaving Lapis as the last of the Crystal Pups without a home of her own. Her mother is also still with us, and they are fine friends, but we could see how much she missed her sister. Our helper dog was showing signs of being overwhelmed by the number of strange dogs we’d fostered in the past eight months, so we had to give him a break from mentoring Lapis. The Shadow Pups were still too small to spend much time with Lapis…she’d learned to play more gently, but she is six months older than they are and those six months make a big difference when one set of puppies is Very Smol. We gave Lapis all the attention we could, but she began to languish. 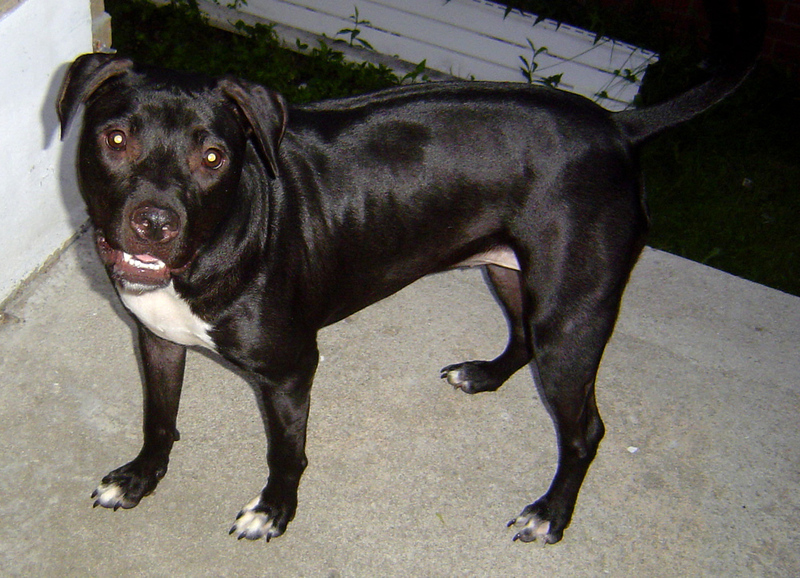 Most of the Shadow Pups found new homes very quickly, but Lapis didn’t – it’s a sad fact that it’s hard to find people who will adopt pit bull mixes, and even harder for black dogs to find loving families. Lapis had two strikes against her just as an accident of birth. Lapis at six months old. This goofy grin is her default expression. 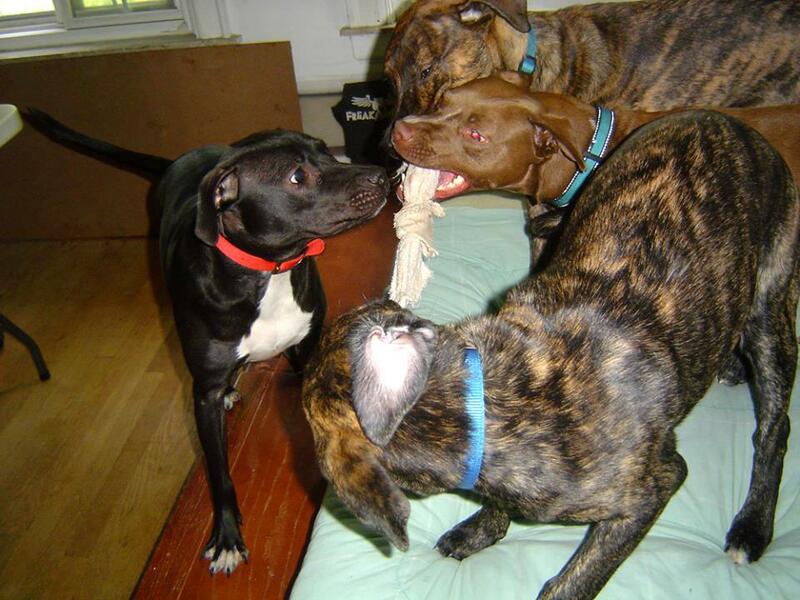 As the remaining Shadow Pups grew, we began allowing them to play with Lapis. We did so hesitantly: the Shadows were at a developmental stage where litters often begin to fight (those early hormones are no joke!) and with her history we were afraid she’d be triggered. She was so lonely for other young dogs, though, we decided to try supervised play with one or two puppies at a time. It was then we discovered a wonderful thing: far from reacting aggressively to the Shadow Puppies’ rough-and-tumble play, Lapis spent their time together teaching them the same lessons our helper dog had taught her. Lapis at 10 months, making sure playtime goes smoothly. If the Shadow Pups got too rough with each other Lapis would break it up even faster than their mother did, and she’d do it more gently too. If they seemed nervous or afraid, she’d sit as quietly as she could until they were ready to play. She was the best big sister we could’ve hoped for, and soon we were able to open our common areas to Lapis, her mother, and all of the Shadows. Their time together was still supervised, of course – Lapis is older, and still had some of her youthful impulsiveness – but once again she had close doggy friends in our home. She began to flourish, and she also became much more loving and open with us. 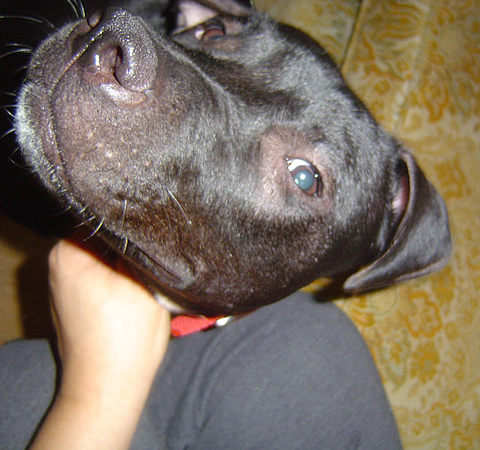 Today, all but two of the Shadows have been adopted (we are keeping Shadow Mama and her sweetest puppy). Lapis is our only foster puppy who hasn’t found her forever home, and it’s time for her to have a family of her own. Lapis’ mother is also still here, and is also a foster, but she’s an adult and it will be easier for her to adapt to her new family. 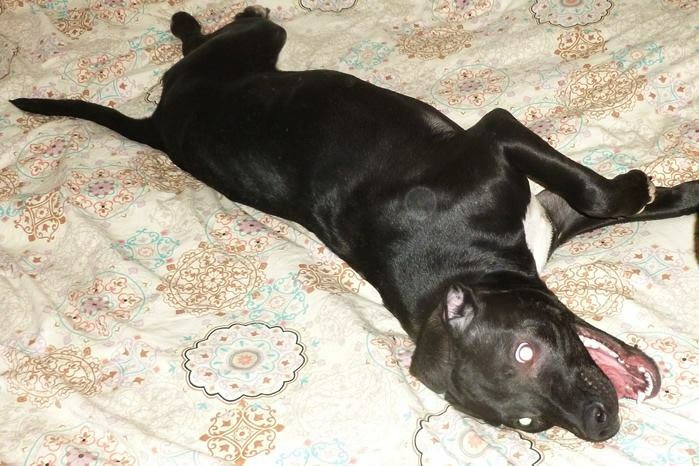 So first we are focusing on placing Lapis; she loves her Shadow Pup brother, and gets along well with the two mama dogs, but it’s time for her to find a home of her own. Lapis hasn’t known any other family since birth, and every week that passes will make it a little harder on her to transition into a new family. …I have porphyria, a condition that makes it painful for me to spend much time in the sun. On some days, even fifteen minutes out in the sun – even with sunscreen and long sleeves, even with my head covered – can leave me in agony for the rest of the day. I spend most of my days asleep and do most of my living at night. During the day, the dogs stay indoors with me. Inside the house, all of our curtains are usually drawn in case I do have to be up and about. My partner works a regular nine-to-five shift, so the dogs don’t get a whole lot of time to run around in the sun. Most dogs can thrive without a lot of UV exposure, but Lapis is not one of those dogs. Over the past couple of months, she’s developed flank alopecia. This is hair loss some dogs experience if they don’t get enough sun. It’s one of those things where by the time you notice it the damage has already been done, and she has bald or balding patches on her face and sides. It doesn’t hurt her, but it also isn’t good to let it continue for long. We’ve taken a few steps to help turn it around – we moved her crate to a space in our house where she can get more sunlight while I sleep, I gear up with sunscreen and scarves and all to give her some time in the yard each morning, and she gets a low dose of melatonin (a supplement which helps combat flank alopecia) each night. These measures will help her fur grow back, but it will take a couple of months and it isn’t a permanent solution. To be truly healthy she needs to be in a family that can give her long walks or let her in the yard during the day, and bring her back into a house where the curtains can be wide open. So as much as we love her, we can’t allow her to become another happy foster fail story. I’ll make the standard pitch for her soon, but first I should let you know there’s one last thing we think is holding up her ability to find that perfect family for her: like her namesake, Lapis is kind of a nerd. Actually, I don’t think that’s strong enough. Lapis isn’t just a nerd. This dog is a hopelessly awkward, weird, opinionated, derpy geek. She warms up to new people quickly, but she is always more excited about the world around her than she is about meeting new people. She can also be kind of shy at the first meeting, to the point people think she doesn’t like them. She insists on looking for birds or trying to get other dogs to play or even sniffing at rocks instead of sitting down and saying hi like a Very Nice Dog. It isn’t dislike, or even disinterest. It’s partly a lack of social skills, and partly wanting so much to be a good girl that she’d rather pretend to ignore new people than risk disapproval. Lapis gets a lot of attention at adoption events – even though she’s a pit mix, and even though she’s a black dog – because she’s a naturally joyful dog. Even in the crate and surrounded by barking dogs, people can see that. Out of the crate, though, she either suddenly turns shy or she wants to explore everything except the people who asked to meet her. All of her potential adopters so far have moved on to other dogs after that first introduction. We don’t blame them. We know most adopters are looking for that love-at-first-sight connection with a rescue dog. The problem is, Lapis isn’t a love-at-first-sight kind of dog. She’s a “Look at this cool thing! Look at that cool thing! Why is everyone staring at me? Now I want to hide…hey you seem kind of nice, whoops I want to hide again…” kind of dog, a geeky wallflower who is so full of love but so nervous about being accepted that she just can’t make the first move, or recognize when someone else is. We can’t blame her, either. She’s met a lot of very nice people at these events, after all, and they always go away. 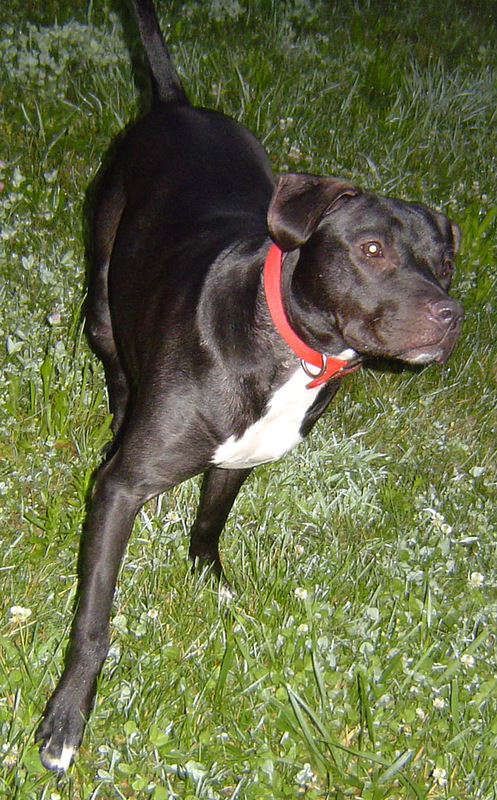 Lapis Lazuli is a black and white terrier/pit bull mix. Her mother is only about 45 pounds, and Lapis won’t get any bigger than she is today (around 50 pounds). Lapis will be a year old on July 23rd. She’s a very smart, curious dog who loves bubbles and destroying squeaky toys. Lapis has flank alopecia, a condition that causes her to lose fur with low UV exposure. She will be happiest if she’s able to get a long walk or half an hour or more of play in a fenced yard every day the weather allows. Bad News Bears, but they’re having a blast. Lapis LOVES other dogs. 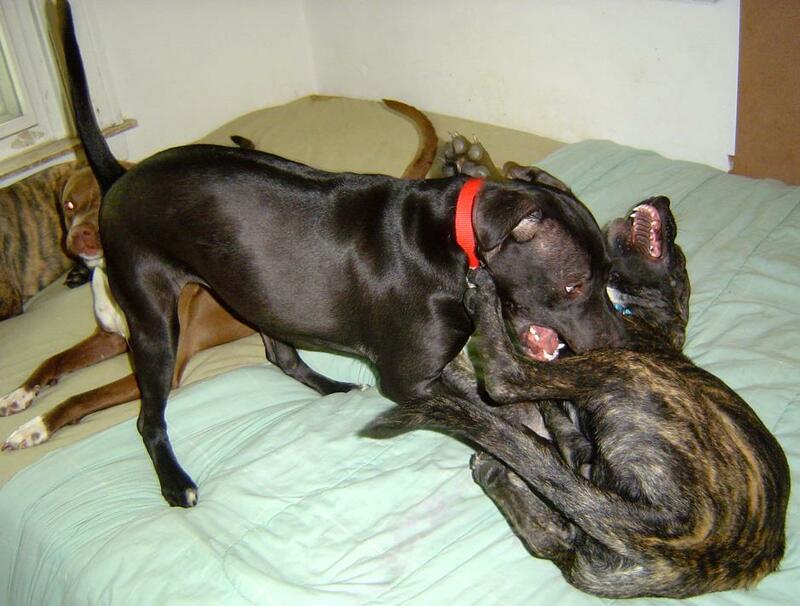 She likes to wrestle, so we don’t think she’d be a good fit for homes with older, nervous, or reactive dogs. She’s good with children over six years old. She knows basic commands in English and some commands in ASL. Lapis sometimes pulls too hard on the leash, but has recently been improving in this area with regular training and we expect her to keep getting better with regular walks. She is very treat-motivated, and asks for petting by butting you with her head and laughing like a fool. Lapis rarely barks in the house unless the other dogs bark first, but will sometimes squawk for attention if she’s feeling lonely. She likes to jump up and down just for fun, but she won’t jump on you if you make it clear you don’t like it. Lapis is a natural clown, and she loves to laugh…if you’re ever wondering what that weird sound is, it’s probably Lapis making her happy noise. Lapis is extraordinarily nimble and coordinated, and we think she’d make an excellent agility dog. She’s house and crate trained. She has been spayed and is up to date on vaccinations. Lapis’ next appearance at a Home Fur Ever event will be Saturday, July 22nd, from 12-7 PM at the Farmington Founders Festival. UPDATE: Lapis will be attending regular Home FurEver events until she’s adopted. Please see their calendar for details on upcoming events. Home FurEver asks that all adult family members attend the event so you can fill out the application together; they also prefer that any children attend so everyone can meet the dogs at the same time. I will do my best to be in attendance but will not be able to stay all day if it’s sunny, so it is best to meet with Lapis early if you want to speak me in person at the event. Please note: Lapis may seem nervous or uncomfortable during your first meeting. We are happy to bring her to the right family for a second meet-and-greet once your application’s been turned in so you can make a final decision (we do ask that you complete an application and the interview so we don’t end up scheduling too many meet-and-greets). Lapis can take a while to warm up to new people, but she is naturally affectionate. Once you’ve won her heart, she will love you forever. If you are interested in adopting Lapis, please come and meet her in person. Her birthday is coming up soon and all we want for her is her very own family, one that will love her and can give her what she deserves: a life in the sun. she is still this shy, sweet puppy inside.